A full production project including pre-press (book and cover design) and print production undertaken for The Haggai Foundation Atlanta in Collaboration with African Missions North America in 2004/5. Produced for distribution at the 2005 USA Annual Convention of the Redeemed Christian Church of God (RCCOG). 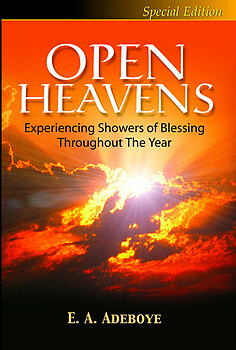 Open Heavens is a devotional book with a difference. Written in a very lucid and warm style, it addresses the hopes and yearnings of believers for a devotional manual that is practical, timely and relevant to the challenges of these times. Open Heavens offers in one breadth, the privilege of benefiting from Pastor Adeboye’s wealth of wisdom, spiritual insight, scriptural clarity, uncommon anointing, prophetic gift and practical application of scriptures to real-life situations. It enables you to face each day with supernatural confidence. Pastor Adeboye has put his ear to the chest of the Almighty, caught His heartbeat and has decided to share with the Body of Christ, what God is saying. This devotional book is classic, and it will change your life and usher you into unprecedented breakthroughs.